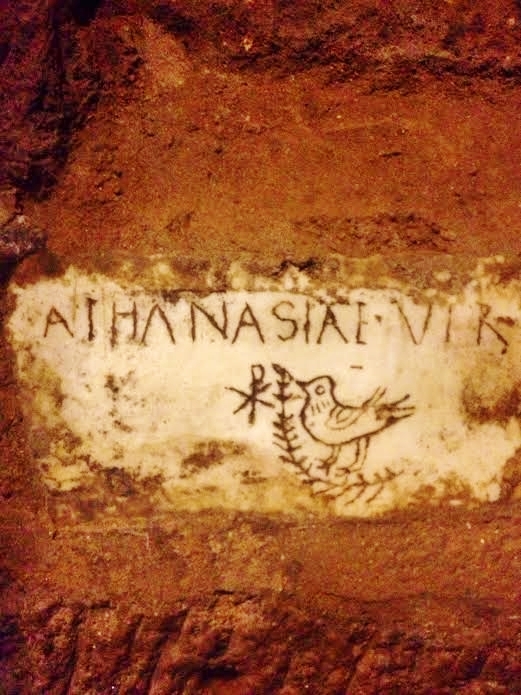 One of the most beautiful hidden treasures in Rome is a small plaque buried beneath centuries of history in the relatively untrodden Catacombe di Santa’Agnese Fuori le Mura. On a wall in one of the chambers well below ground is preserved a rare example of early Christian funerary art. It is the grave plaque of an infant, a girl named Athanasia. We knew nothing about her save that she was baptized a Christian. On the plaque that covers the niche is her name, a Chi-Rho, a palm, and a dove. The dove is a symbol for the soul; the palm, that of victory; the Chi-Rho, one of the earliest symbols for the name of Christ. Read together, the epitaph is stunning: Christ gives victory to the soul. Unknown to the world apart from this reminder of her brief life, Athanasia teaches more than words can say about the nature of death, and through it the nature of life itself — lessons on Christian helplessness and the perfecting role of grace. Helplessness is the incapacity or inability to do something. Whatever the context, helplessness is experienced as paralysis. In the spiritual life this paralysis can take different forms. Skepticism, indifference, neglect, fear, constraint — these are all manifestation of spiritual helplessness. The temptation, and the often attempted recourse is to rely on ourselves. The nature of helplessness, however, omits this possibility. Self-reliance is futile. And further, it is dangerous. Abide in me, and I in you. As the branch cannot bear fruit by itself, unless it abides in the vine, neither can you, unless you abide in me. I am the vine, you are the branches. He who abides in me, and I in him, he it is that bears much fruit, for apart from me you can do nothing. If a man does not abide in me, he is cast forth as a branch and withers; and the branches are gathered, thrown into the fire and burned. The fear of incapacity is inherently human. We are made to act: caused by God, in the classical philosophical sense, to be causes ourselves. For good or bad, the history of human lives is a continuum of action: wills exercised for ill or charity, in freedom or by coercion; actions committed or omitted. Helplessness, whether physical or mental, emotional or spiritual, is a sword thrust into the heart of action. We fear being unable to do the innately familiar. And when we are so paralyzed we experience pain. This pain, understood as a kind of suffering, an interior struggle, adds an additional layer of depth to the experience of helplessness. We become as infants, helpless and dependent, and yet by virtue of our conscious life, viscerally discovering, knowing this about ourselves. …[S]uffering gives people a more accurate sense of their own limitations, what they can control and cannot control. When people are thrust down into these deeper zones, they are forced to confront the fact they can’t determine what goes on there. Try as they might, they just can’t tell themselves to stop feeling pain, or to stop missing the one who has died or gone. And even when tranquillity begins to come back, or in those moments when grief eases, it is not clear where the relief comes from. The healing process, too, feels as though it’s part of some natural or divine process beyond individual control. People in this circumstance often have the sense that they are swept up in some larger providence. The larger providence can certainly be seen as the secular charity we are familiar with — the benevolence of others, or that we offer ourselves. But the spiritual life is not a circle. It is directed upward or downward. And it is this reason that leads to frustration. For the choice remains ours to ‘ask that we may receive’; the request has to be directed to God. Ultimate agonies will teach us this. The right response to this sort of pain is not pleasure. It’s holiness. Of our own we can do nothing. This does not mean we cannot act, for certainly, in freedom, we can, but that we cannot achieve that level of perfected action, yes, that holiness which satisfies the soul. We cannot raise ourselves from the depths of misery, or vanquish real agony, or even yes, rise from the dead. The most we can attempt is a search for comfort, and even so we discover major gaps and deficiencies. The reality of the Christian life is that it is fueled by grace, lavished on us in the form of ontological changes that take place in the Sacrament of Baptism and those sacraments that follow. The life of the soul requires Christ. Anything else is the life of the body, over which at times we can attempt to exercise control. But the soul requires more than the mundane. The soul requires the action of grace to operate to its fullest potential. And that potential is union with God, here, now — manifest possible in the Incarnation — and fully then, in a final hoped for beatitude. The Infant of the Catacombs presents us with the emblematic paradigm of the Christian Life: Christ indeed gives victory to the soul. Christ became a man; God became incarnate for us. Christ heals the sick, Christ raises the dead, Christ dies on the Cross, Chris rises from the dead and lives; Christ forgives sins, Christ is present in the sacred Flesh and Blood of the Eucharist, Christ resides with us still. Such is the beauty of the awe-full grace of God. And it is so that our helplessness is transformed not by our own action, but by the action of grace — a probing and healing work far more efficacious than the strongest attempts we can muster at survival in our wounded frailty. It this confrontation that Lent exists to engage. The depths are sometimes very deep. We are called to visit the catacombs of our lives and there find the reminder of victory that awaits souls who rest in Christ. May the Week of the Passion, the week we call holy, bring us to the gates of hope — that souls, fettered, helpless, fearful, might drink from the Font of grace, be nourished on the Vine, and find victory in the One who conquered death forever. And lives. This is a sequel to Revelations on Pain.